The Ramsey County Regional Rail Authority (RCRRA) and its partners, including Metro Transit, are reaching out to residents and businesses in St. Paul's East Side in a conversation about transit service in that area of St. Paul. The purpose of the project is get St. Paul’s East Side community more involved in transit decision-making. A project steering committee will hire community organizers to begin outreach this summer. 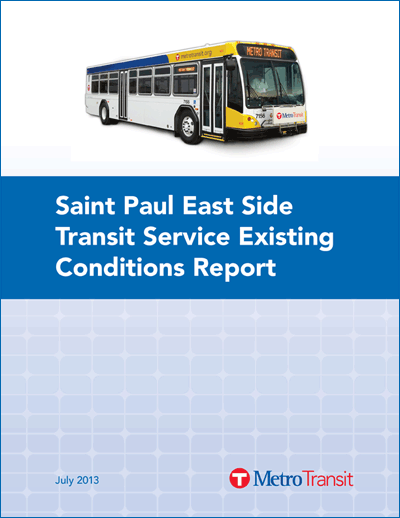 The report below provides an evaluation of current transit service in St. Paul's East Side. It examines existing conditions as well as potential new service, transit market opportunities and facility needs.